The West African Nation of Ghana is renowned for numerous things – the first country in the continent to gain independence, undying fascination with football, and being the second largest exporter of Cocoa. As a result of entrepreneurs Wisdom & Kylie Gbidi’s fortitude and foresight, yet another well-loved Ghanaian item is gaining popularity in Australia- Bolga Baskets. The husband-wife duo who met in Ghana in 2008 and married a year later, is the brains behind Afropacific, a Ghanaian-Australian (Wisdom and Kylie being Ghanaian and Australian respectively) enterprise that ethically sources multi-functional and beautiful Bolga baskets from the town of Bolgatanga, Upper East Region of Ghana to sell them in Australia and other countries. The sturdy baskets, quite popular in Africa, are made using elephant grass that grows abundantly in the region. 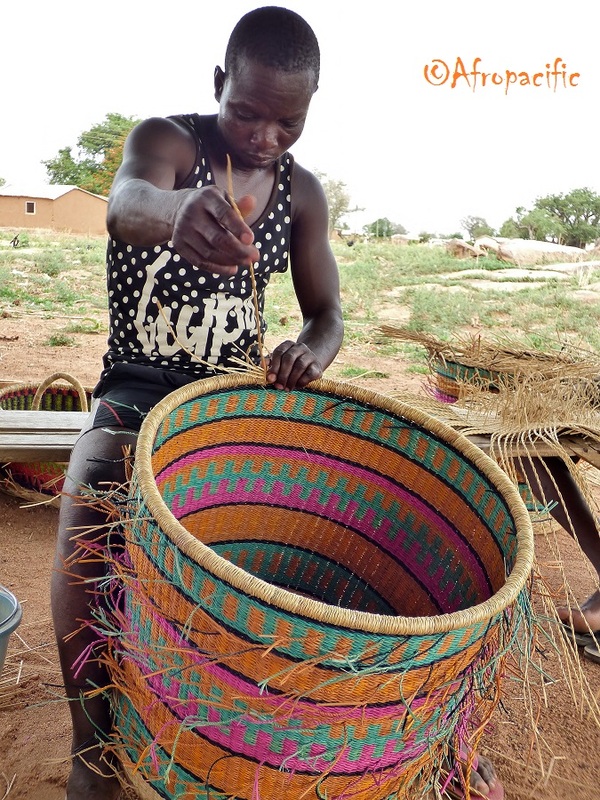 The art of Bolga basket weaving is intrinsic to the culture of the Bolgatanga region, from which the basket derives its name. Wisdom and Kylie, through their 10-year-old enterprise, is trying to empower the weavers, contribute to sustainable development, and ensure the longevity of traditional African practices and craft. Furthermore, to guarantee that the proceeds from the sale of the baskets go to the weavers and not to intermediaries the duo works directly with local Ghanian weavers and co-operatives. In conversation with TAL, Kylie, who took a sabbatical from her job as a physical education teacher to contribute full time to the company speaks about the reasons that led to the inception of Afropacific, the challenges the duo had to overcome, and the enterprise’s future plans. Please tell us about Afropacific and its underlying governing principle - Trade Not Aid. 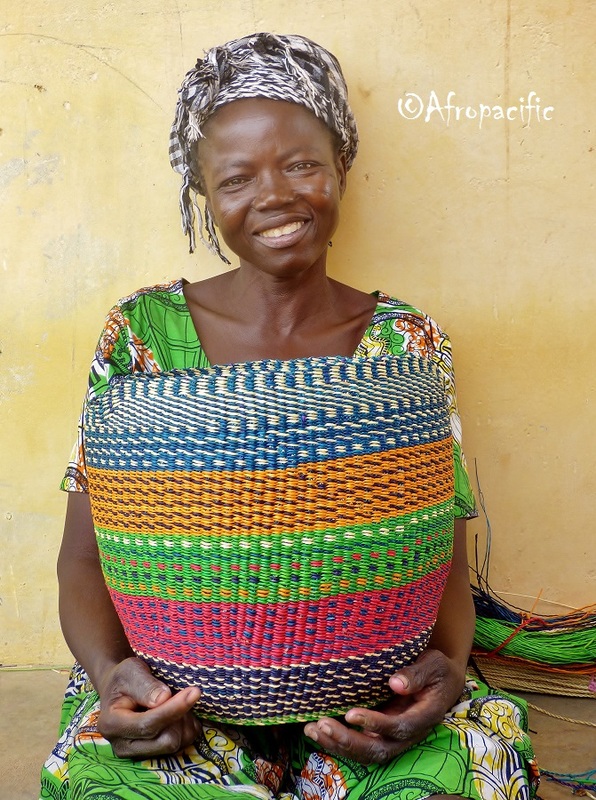 Afropacific is a growing business that is rooted in a symbiotic relationship – we buy products from talented Ghanaian basket weavers, and they are reimbursed directly, leading to a sustainable economy. Therefore, the more we sell, the more we buy, thus growing the businesses of both the weavers and ours. Our philosophy Trade Not Aid stems from the understanding that charity and donations are not sustainable long term practices. True emancipation develops from being self-sufficient and having a robust sense of self-worth which, in turn, comes from being economically independent. Thus, purchasing our ethically sourced, eco-friendly products helps empower the talented artisans of Bolgatanga and surrounding villages, contributes to sustainable development within the region and preserves traditional craft skills and practices. How did the enterprise come into being and what kind of research was undertaken to gauge if there was a demand or market for such products? When Wisdom immigrated to Australia more than ten years ago, finding reliable employment was difficult. It was also hard to be an employee after being your own boss for so long as he had been an independent trader; sourcing products like mobiles and fashion materias from other countries to be sold in Ghana. After failing to find an employment opportunity that excited him, Wisdom decided to capitalise on his vast international trade experience and import handcrafted items from Ghana and sell them in Australia. It was an exciting idea but before we committed ourselves entirely to the project we wanted to analyse the market a bit. We wanted the trajectory of our business to achieve three goals. Weaver Asibi and her baby. The first goal was to test the waters and see if there is a demand for our products. So we flew in nine sacks of baskets, jewellery, fabric, wooden carvings and masks, to Australia, and traded them at markets and festivals around Queensland and New South Wales. This experience gave us an insight into Australia’s local market demands and also helped evaluate customers’ reactions to our products. Given its assets like durability, functionality, and being a splendid eco-friendly alternative to plastic bags, the baskets quickly grew in popularity. For close to seven years we would participate in pop-up and weekend markets in and around Australian cities to create awareness about our products. Soon, as the demand for our baskets grew, wholesale requests by companies that wanted to stock up on our products started pouring in. By reinvesting our profits during the first few years we were able to buy sufficient stock to fill a 20 feet shipping container to sustain our own retail trade whilst also supplying others. Accepting wholesale offers from other companies helped us achieve our second goal – no more setting up stalls at markets. Don’t get us wrong; our market-experience was enriching in many ways. However, the early morning starts, persevering through inclement weather, unwittingly competing in market politics, and driving for kilometres, were getting strenuous. Our third goal was to take our business international. Today, in addition to the Australian domestic market, our baskets are shipped to China, the United Kingdom, Europe, United States of America and Japan. Currently, we seem to be on the cusp of realising our fourth goal: both of us working for the business full time – Wisdom has been with Afropacific since the start, and I have just joined the company on a full-time basis. Beyond this, we hope to be able to help the economy further by growing the company to the point that we can offer employment opportunities to others. Having a brother with Down’s Syndrome, I have a particular interest in trying to create a disability-friendly workplace. Twisted elephant grass ready for weaving. How are these baskets made; please take us through the steps involved. The baskets are made from sundried elephant grass which grows in the tropical grasslands of Africa. Once harvested, sundried and cut into uniform lengths, most of the grass is hand-dyed using traditional natural dyes made from plant and minerals, as well as non-toxic fabric dyes to achieve contemporary colours. Dyeing is done in cast iron or aluminium vats boiled over a fire, and once the desired shade is obtained, the grass is again sundried before being split in half, lengthwise, and twisted to give strength. Weaving begins at the base of the basket and requires physical and mathematical skill to create a symmetrical shape with intricate woven patterns that match up around the circumference. During this process, the basket looks like an echidna, with spines of grass sticking out. Once complete, this excess grass is trimmed with a blade to reveal the beautiful patterns woven underneath. It takes about three days to create a sizeable round market basket. Please tell us a little about the history of this unique basket making art of Ghana? Is it a traditional art that’s been passed on from generations? Baskets weaving is a skill that has been passed through generations over centuries in African cultures. Traditionally, baskets were used to sieve the husks from pounded guinea corn/millet and the fibre from the local alcoholic brew, Pito. They were also used in traditional ceremonies, such as weddings and funerals to carry gifts. The present generation of weavers has modernised and adapted their skills to offer a more diverse range of baskets that can be used for practical or decorative purposes. Although baskets are woven in most African cultures, the quality and mastery of those made in Ghana are well respected. Hence, Bolga baskets are also sought after and traded to other African countries. Do the weavers work for Afropacific on a contractual basis? How are these baskets brought to Australia? The artisans we work with run their own enterprises. Some are farmers and supplement their incomes through basket-making, while others depend entirely on weaving. Purchasing baskets from the artisans is a continuous process which occurs on market days (in Ghana) or by travelling to various remote villages. The procurement of the baskets and bringing them to Australia is a long drawn process. The baskets are purchased up front and are taken to the leather handicrafts worker for adding goat leather trim to increase the strength and comfort of the handles. Then they are sacked and stored until there is sufficient stock to organise a container to ship to Australia; all of which takes about four months. Once the container is ready, it takes six to seven weeks in transit and another two weeks to clear customs and quarantine processing on arrival in Brisbane, Australia. What are the challenges you faced initially and continue to suffer? How did you or do you overcome them? Oh gosh! The challenges were and are many, mostly related to bureaucracy and currency exchange. In the early years when Wisdom would travel to Ghana to purchase baskets and restock, accessibility to our funds was difficult. You can only take $10,000 cash when you leave Australia and the remainder needs to be wire-transferred. We used a well-known money exchange company, but they were quite difficult. They would consistently block my transactions to Wisdom and ask intrusive questions like “Have I met my husband?”, “When was the last time I saw him”, “When was the last time I slept with him”, “Have I been to Ghana?”, etc. Then they would ask me to provide numerous documents from marriage certificates to entry visas into Ghana – which was quite understandable. However, despite all the trouble, they’d still stop my transaction. Meanwhile, a new bank became operational in Ghana, and we were able to open an account there and make quick transfers of funds. Another challenge was manoeuvring Customs and Quarantine rules that any container arriving in Australia has to go through. In the early years, there were many barriers to overcome, and the rules were constantly changing. However, we persisted and bounced back from the difficulties because of our steadfast belief in our products. Probably the most devastating thing that happened was when our container was stuck on the docks in Malaysia for two months without explanation. By the time it finally arrived in Australia, it had been in transit for close to four months. Due to lack of proper care, the baskets at the top of the container were scorched, and the ones lower down were mouldy. At the time, we were unable to obtain transit insurance because of “pirates” in the waters the container ships passed through. The financial loss was a massive blow to us, but we had to put the incident behind us and soldier on. ﻿After so many months of being operational, what kind of impact do you think the enterprise has had on the economy of Bolgatanga? Over the last ten years, we have seen much development in the region, and we would like to believe we played a small part in it. Individual prosperity has allowed the artisans to build their own houses, educate their children, buy livestock and purchase the luxuries of life we all like - mobiles, home accessories, fashion, etc. How has the reception been like for your baskets, especially here in Australia? The baskets are very popular in Australia, and we have stockists in all states except Northern Territory. How can one purchase a basket or other products that you sell? Through Leather and Weave, which is the retail outlet brought to you by Afropacific. The website showcases ethically sourced bags, baskets and textiles from around the world (Ghana, Mali, Burkina Faso, Ecuador, Colombia, Peru, Morocco). What are your future plans for the enterprise? We have many plans in the pipeline! We would like to increase our retail profile and sales through our web-store, continue to offer baskets to the world for wholesale, provide employment opportunities for people with disabilities, continue to support the enterprises of our artisans through increased trade, and also help drill bores to supply water in some of the remote communities in the region. To learn more about their journey follow them here.